I love my Roth IRA (and my Roth 401(k)). Throughout my twenties, I didn’t have access to a workplace-based retirement account, so the IRA was a retirement-life-saver. I also was not making much money as a grad student, so using a Roth made total sense. When I speak to current grad students, I advocate using a Roth IRA for retirement savings. But at some point, doesn’t a traditional IRA or 401(k) start to make more sense? I know that there are some PF gurus who advocate using Roth accounts forever and ever and even converting traditional money to Roth money. They love the idea of paying taxes on your money one time (now) and never again. But I have a favorite PF guru (Ric Edelman) who takes the opposite stance: traditional tax-advantaged accounts should be the default, and Roths should only be used in special circumstances. Matt from Mom and Dad Money also makes a very cogent argument for traditional tax-advantaged retirement accounts, even for young/lower-earning people. Even that first-pass question is difficult because you have to guess at your marginal income tax rate in retirement, which depends both on your earnings/lifestyle trajectory and also on how the tax brackets or even overall tax structure will change with time (how many Congresses are there between now and your retirement?). For Millennials like me who won’t have a pension and who aren’t really counting on Social Security income, our personal savings (or possibly ongoing income streams) will be providing most or all of that retirement income. That means that there might very well be available room in the untaxed/less taxed income brackets. What good would it do to have all Roth money at that point, having paid all the necessary taxes already, when you have the opportunity to withdraw money from your tax-advantaged retirement accounts income tax-free? My ideal is to have, upon retirement, a mix of Roth and traditional money so that I can optimize my tax situation on the back end. Our plan, therefore, was to switch from using a Roth to using a traditional IRA/401(k) when our income bumped us up from the 15 to 25% tax brackets. 2015 was our last year in the 15% tax bracket; starting in 2016, we are in the 25% tax bracket (and higher, hopefully, later). However, we’re still using Roths. What gives? The discussion in this post so far has focused solely on federal taxes. You have to do the same kind of analysis for state (and local) tax that you do for federal tax when you’re comparing your current tax bracket with your hypothetical future tax bracket. Perhaps this conversation is usually omitted because we are assuming that the saver will not move states between now and retirement, the state’s marginal tax brackets won’t change (as dubious an assumption as it is for the federal tax code! ), and retirement account distributions are taxed as ordinary income. But Kyle and I are planning to move states in the next few years. Right now we live in Washington, which has no state income tax. We plan to move to California, which has super high state income tax. (If we were living there now, our marginal tax rate would be at least 8%.) So for us personally, we went from a federal+state marginal tax rate of 20.75% when we were living in North Carolina to 15% in Washington in 2015 to 25% in Washington in 2016, but we’re comparing that to 33% in California if we were living there. Because we see this time we’re living in Washington to be a bit of a tax break for contributions, we contributed to our Roth IRAs/401(k) in 2016 and will likely stay that course until we move to California. This is a way for us to get a bit more money into our Roth IRAs before we switch (probably permanently) to traditional IRAs/401(k)s for the majority of our working lives. Brief explanations and rules of thumb about things like Roth vs. traditional tax-advantaged retirement accounts are great for people who are being introduced to the concepts for the first time, but there are a lot of complexities worth considering as well. Everyone has to decide for themselves (or with their financial advisors) what their tipping point will be, depending on their current life (income, expenses, and tax brackets) and their expected future life. Don’t just guess at your marginal federal income tax rate in retirement and stop there! What’s your personal (or general) determination for the tipping point between Roth and traditional contributions? Do you take state tax or other nuances into consideration when you’re choosing between Roth and traditional accounts? 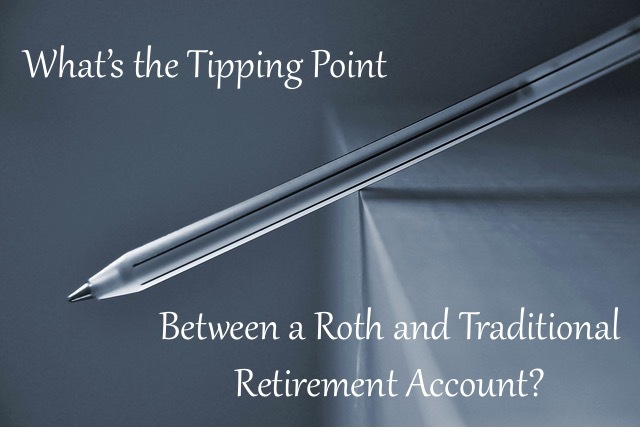 3 Responses to "Where’s the Tipping Point Between a Roth and Traditional IRA?" Thank you for this post! It is always so helpful to see other thoughtful people’s processing on these decisions. Like you, I think our overall goal is to end up with a healthy balance of Roth and traditional accounts upon retirement. Glad to hear that you agree! Have you started generating both Roth and traditional savings? Thanks for the post, a lot of good thoughts around traditional vs. Roth. I think a blend is best if possible, you never know exactly how your final situation will turn out so it would be good to have a buffer. Although if you have a strong sense of whether you’ll be in a higher tax rate later vs. know then that would make the decision easier. But these are good problems to have!